Claire Daniels, of New Milford, finishes second in the CIAC Girls Cross Country State Open Championship at Wickham Park in Manchester on Nov. 1. Freshman Claire Daniels continued her standout debut cross country season as she ran to a second place finish at the CIAC State Open last Thursday at Wickham Park. Daniels ran the Wickham course in 18 minutes and 58 seconds to finish second to Pomperaug sophomore Kate Wiser. 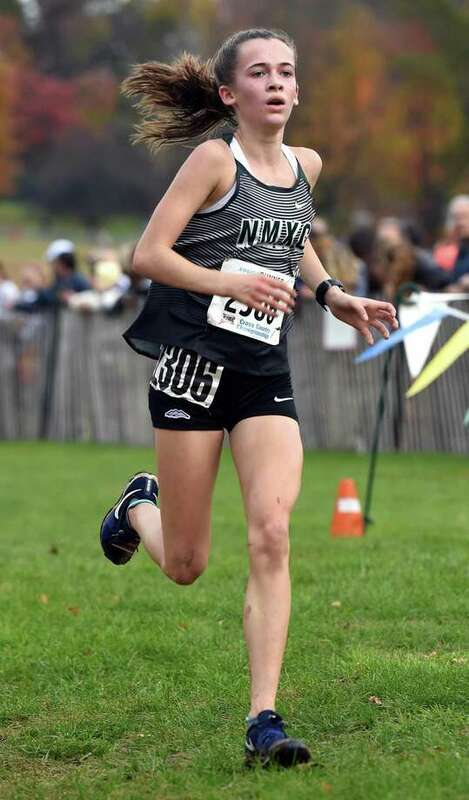 Daniels’ run earned her the highest place finish for a New Milford girl ever at the State Open. It wasn’t easy either. Wickham is a tough course and the state’s best runners were in the field. The Green Wave runners also had to overcome a little adversity at the start. “What makes our finishes even more impressive was the fact that the girls had a tough box assignment, which meant they had to come across the starting field area to catch everyone and got pinched well back of the lead pack,” Vaughan said. “Claire was in 17th place at the one mile mark and then started to make her move, she has worked hard on her downhill running and uses that to her advantage in these big races. While he has seen her turn in great performances time and time again, Daniels’ Class L title win and runner-up at the Open were impressive to coach Vaughan. “It's hard to believe she is only a freshman because her ability to feel out her competition and dissect a course usually only comes with many years of experience,” he said. Katie Delaney ran well coming in 21st and earning All-State recognition for the second race in a row and qualified for New England’s in her first State Open. Daniels and Delaney both earned spots in the New England Championship meet. The girls will travel to Manchester, New Hampshire, and race at Deeryfield Park on Saturday. Also at the State Open, Brooke Morabito battled to come in 32nd just missing out on New England’s by seven spots. “This was a big improvement from her last state open dropping 33 spots in the process, she was 65th her sophomore year,” Vaughan said of Morabito. As Daniels and Delaney prepare to run in New Hampshire, Vaughan feels they have the ability to make their mark in the race.